Microbeads have emerged as a serious threat to aquatic ecosystems. Luckily, activists in the US are securing victories at the state level and are building up momentum at the national level. Aquatic systems across the United States and the world are being flooded with tiny, seemingly innocuous pieces of plastic. The flood of these microbeads into water systems is largely due to a recent trend of personal care manufacturers mixin tiny plastic beads into body wash, toothpaste, and other cleaning products. Supposedly, the microbeads will help clean and exfoliate skin. In reality, these beads could pose a major threat to ecosystems. Now, legislative battles are heating up, especially at the state level where numerous state governments either have or are considering banning the use of plastic beads in personal care products. At the national level a bill has already been introduced in Congress, the bipartisan Microbead-Free Waters Act of 2015 (H.R. 1321). The bill has managed to attract 34 cosponsors, with signees coming from both parties, but still lacks the clout needed to make its way through Congress. So far, activists have been finding better luck at the state level. 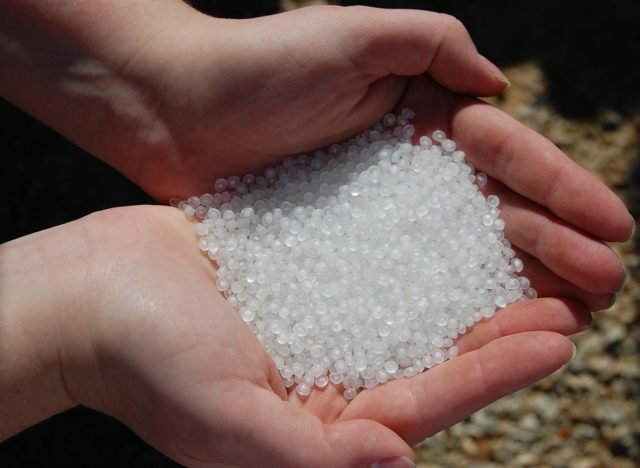 Illinois, Maryland, and several other states have already banned and restricted the use of plastic beads. Earlier this month the California state legislature also passed a bill banning the use of microbeads, but it is still awaiting the governor’s signature. If governor Jerry Brown does sign it into law, it’ll be a major victory given California’s massive population. Researchers from seven different institutions have found that as many as 8 trillion microbeads could be entering waterways in the United States each day. While the beads are banned in many places, researchers warn that loopholes in existing legislation, as well as a lack of any legislation at all in many states, means trillions of the beads are still making their way into waterways. Still, activists are stepping up their fight against microbeads, and have secured a number of victories in state legislatures. So far the cleaning properties of these microbeads is questionable, but the potential damage to ecosystems is not. These tiny microbeads are able to pass through filtration systems and make it into waterways unimpeded. Since they are made of plastic, they do not break down naturally. This means they accumulate in nature. Animals frequently swallow and absorb the plastic, which could potentially be toxic. Microbeads are generally about the size of a grain of sand and add a bit of grittiness to cleaning products. In theory, they help scrub away dirt, food, and other things. Dentists and other healthcare professionals have warned, however, that the beads could be bad for human health. With teeth, for example, it is believed that the microbeads can actually damage tooth enamel, and that some of the beads will be absorbed by the body. Studies have already found that animals are ingesting these plastic beads, which can cause damage to their digestive systems. Plastics can also carry poisonous contaminants that are then transferred to the animals themselves. One study even suggests that 90 percent of seabirds will have plastic in their guts by 2050. It is believed that as many as 60 percent of seabirds already have plastic in their gut. Given the gravity of the situation, it’s easy to understand why political pressure is growing. While progress is being made, the fight is far from over. Still, political pressure is forcing many companies, such as Colgate-Palmolive and Johnson & Johnson, to voluntarily agreed to remove the beads. If consumer pressure continues to mount, bills may become redundant. Regardless, activists likely won’t be giving up the fight until all soaps, toothpastes, and other products are completely plastic free. Besides beads, plastic remains a huge threat to the world’s oceans and waterways. In 2010 an estimated 8 million metric tonnes of plastic made its way into the world’s oceans, and scientists expect the amount to keep rising. Worse yet, the ocean’s animals have proven prone to consuming the plastics. Pollution is now a major issue for governments around the world. Often, governments and taxpayers are stuck footing the bill for cleaning up pollution. Still, increasing regulations to crack down on pollution has proven difficult as such regulations can restrict economic growth.